A papyrus codex was shaped much like a modern book; it consisted of several leaves, or pages, bound together. Often, as in this case, the pages were numbered at the top. 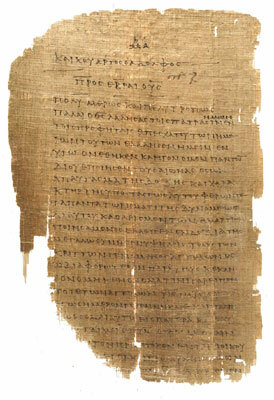 On this page, the beginning of Paul's Letter to the Hebrews is visible; the beginning is marked by a horizontal line and the title of the new section. To reach us, email papywebmaster@umich.edu or visit our contact page. Copyright 2004 The Regents of the University of Michigan | Last Updated June 10, 2004 .